The Old Waiting Rooms has many original features and has been tastefully restored to provide unique holiday accommodation comfortably sleeping two people for short breaks or full weeks. The 19th century building dates back to the opening of the railway line in 1847, the house was built a year before 1846 , and is built from Hunmanby bricks; the old clay pit is now a haven for freshwater anglers just two minutes walk away. Also close by are shops, pubs and restaurants and a nine hole pay and play golf course and gym. The acccommodation is all on ground level and there is designated parking in front of the building. We provide drying facilities for outdoor gear and equipment for walkers, cyclists and bikers and locked, covered parking in the rear courtyard for bicycles and motorbikes. There is ample storage for panniers. We also provide bicycles for the use of guests. The large bedroom has a comfortable king size double bed. All trains stop at Hunmanby station which is on the Heritage Rail Scarborough to Hull line with trains every hour or so from after 7a.m. until 8-30p.m. (fewer on Sundays and in low season). 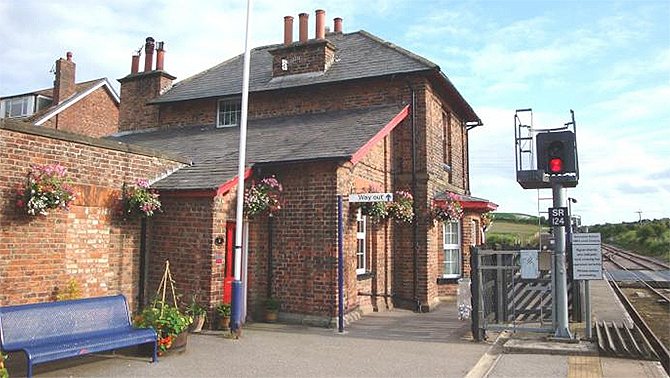 The Old Waiting Rooms are just 1.5 miles from Yorkshire’s Heritage Coast and only 30 mins away from the North Yorkshire Moors. All these beautiful attractions can be easily accessed by car or public transport and the old Waiting Rooms offers the chance to explore the Yorkshire’s Wolds, Moors and Coast entirely by train. The whole area has plenty of picturesque walking and cycling routes. There are golf clubs in Filey and Scarborough, bird watching at Bempton cliffs, Filey Country Park and Brig and sea fishing at Filey. Play and pay golf, gym and a coarse fishing lake are all in the village. So, whether you like a relaxing holiday or enjoy a more active one, The Old Waiting Rooms offers you plenty of opportunities.